Produktinformationen "Female Rabbis, Pastors, and Ministers"
Nach dem Zweiten Weltkrieg hat Ernst Ludwig Ehrlich (1921-2007)herausragende israelische Gelehrte in englisch- und deutschsprachigen Veröffentlichungen in Europa und Nordamerika bekannt gemacht. Die zu diesem Zweck von ihm begründete Reihe Studia Judaica bietet heute ein Forum für wissenschaftliche Studien und Editionen aus allen Epochen der jüdischen Religionsgeschichte.How do female rabbis, ministers, and women in other religious leadership roles transform their religious traditions, the very role of religion modern society, and the way women understand themselves?This volume convenes leading scholars and practitioners from various countries and traditions to discuss these questions at the intersection of gender studies, theology, and religious studies. Historical and current developments within Judaism form the starting point for a debate touching on questions fundamental to modern societies. How do religious institutions, ideas, and practices become catalysts for processes of modernization? 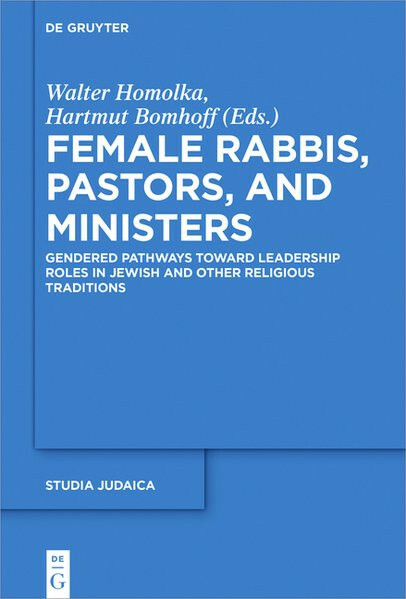 How does the access of women to leadership roles transform the inner lives faith traditions, female and male spirituality, and gender roles within societies?This volume offers contributions by modern Judaism to these questions and a multi-voiced conversation within and among other religious traditions. It thereby opens up new perspectives on an issue crucial to the future of religion in modern society. Unser Kommentar zu "Female Rabbis, Pastors, and Ministers"